This evening was one of the highlights of the summer season so far, in terms of a few of our older athletes having top performances. As per usual there were perfect conditions at Watford, but with nineteen 1500m races and three 3000s, the meeting didn't finish until close to 11pm. George Duggan ran one of his best races of the season to win the final 1500m and the fastest race of the nigh4t in 3.52.91, just outside his personal best. Earlier Dan Seagrove (under 15, 4.36.99) and Alasdair Kinloch (u17, 4.05.46) had run personal best times over the same distance. Then came the 3000 metre races and there were three of them. Charlie Crick went in the first and ran a very mature race, for a first year under 15, making his debut at the distance. He followed the leaders and managed a sprint at the finish to secure second in 9.33.23, which moves him to 10th on the UK age rankings, despite another year in the age group. In race two, Ben Cole found himself at the front and having to push the pace along on occasions and would probably have run faster in the last race. In the end he was third in a pb of 8.48.44, whilst Michael Ellis (u20) took 20 seconds from his best with 9.26.36. The final race of the night saw a very competitive field taken out by Jonny Hay of Aldershot, who ran 8.05, leaving a gap to the chasing pack. Dominic Brown, making his debut at the distance ran a very impressive 8.16.13 for third, with Ryan Driscoll slashing his pb by ten seconds in sixth with 8.20.40. Kieran Reilly ran 8.21.78 in his first race since early May and James West (u20) set a pb of 8.38.54. Not far behind was Chris Cohen, who moved from a 9.12 best to 8.41.67 to go 7th on the UK under 17 rankings. Dominic and Ryan's times were the second and third fastest 3000s run by TAC athletes in the last ten years (probably a lot longer but my research doesn't go back anymore). Full results are at - http://www.watfordharriers.org.uk/indexnc.htm with a summary on the Results 2014 page. TAC put in a fighting performance to finish fifth of the six clubs and will be relegated from this premier division. However, we showed today that we can compete, although over the season too many event gaps were eventually our downfall. This last match in the premier division was littered with some terrific performances and a host of personal bests from the distance runners. However, maybe the highlight came in the final race of the day, when the under 20 mens team broke the club age group record with 3.21.16 and were only a couple of tenths of a second from an outright record. It was also the fastest club under 20 mens team in the UK in 2014. The splits were Anthony Bryan 51.7, followed by three middle distance runners in, James West 51.0 George Duggan 50.9 and then Sean Molloy throwing everything he had at it with a superb 47.5. There was also a cracking under 20 mens 1500 metres where James West was four seconds inside the league record with 3.49.29, but still finished second to Liam Dee, of Shaftesbury. Provisional results are on the Results 2014 page. Ben Errington (800m) and Lizzie Miller (1500m) both ran for Kent in this match. Full results are on the Results 2014 page. Well done to Dan Bradley for securing the Park Run Age graded grand prix title. He was one of three club members to complete maximum allowable 5 scoring races out of the 6 possible races (others were Cain Bradley and Lucy Kingston. In total 43 TAC runners completed at least one of the designated runs. Full results are in the file below. Dan will be presented with the engraved trophy shortly. The race director confirmed to me today that the course is about 80 metres over distance, but kept that way for consistency and ease of marking. TAC will have a large number of helpers at the Tonbridge Parkrun on 23rd August, marshalling and pacing etc. Graeme Saker (17.08) was second home at Maidstone. TAC athletes experienced a real mix of performances at Eltham with a few personal bests and a few disappointments. The 'Crowborough' based duo of Nicole Taylor and Ryan Driscoll continued their terrific 2014 form, with two more big personal bests. Nicole reduced her 3000 metres pb to 9.49.73, to take 34 seconds from her best, set in 2012. Ryan dropped down distance to 800 metres, for the first time this season and took more than 2 seconds from his best with 1.55.99. There was also a personal best over 800m for Sam Crick who trimmed his time to 2.10.26, a 0.4 second improvement. Alex Hookway had his first race, since pulling a hamstring and was satisfied with a 2.01.71 clocking over 800m. Bede Pitcairn-Knowles was not far away from his best at 1500m with 4.42.57. Meanwhile, Harry Paton, Sean Molloy and Christian Lee, all left Eltham dissatisfied with their runs. TAC had nine athletes in action at Oxford, racing over 800m, 1 mile or 5000 metres. The top performance came from Dominic Brown, who won the B race mens mile in 4.07.01, despite a relatively slow first half of the race. Sean Molloy became the fourth under 20 athlete in the UK to dip under the 1.50 barrier at 800 metres, when he finished fourth in the men's A race in 1.49.96. Ben Cole produced a superb run in the C race 5000 metres to finished third in 14.52.08, which is his first time under 15 minutes. Tom Cox struggled in the heat, in the same race but still sliced a few seconds from his pb with 15.30.54, whilst Dan Bradley ran 15.43.44. George Duggan ran 1.53.24 in an 800m, whilst James West with 4.15.30 and Henry Pearce with 4.17.93 ran mile pbs. Westy gave it a really good go in the mens A race and was around 3.03/4 with a lap to go, before a very tough last lap. Finally Ashley Gibson was just outside her 800m pb with 2.10.74. 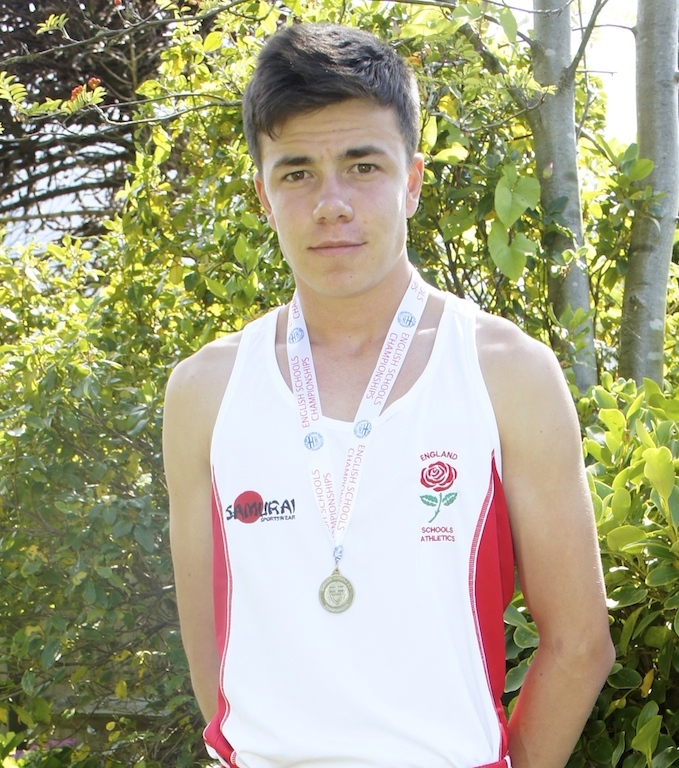 Chris Cohen finished third over 1500 metres, running for the England Schools team, in Cardiff, against Wales, Scotland and Ireland. He ran 3.58.28. Full results are on the Results 2014 page. Video loaded of 1200m and 1500m races ! I believe that Tonbridge AC placed third in this final match of the league and this means that they will remain in the Southern Premier Division next year. No more details or results have been received as yet. A traffic nightmare both ways around the M25 failed to prevent the TAC group getting to Watford for a superb night of middle distance running. A major hold up at the Dartford Crossing meant that James West couldn't get to Watford in time for the British Milers Club races, so missed out on being in a 1500m race that was won in 3.37 ! Rather than abandon any thought of racing, James decided to still get to Watford and race the open 800m, where he was seeded in the final and 'fastest' of more than twenty races. He was rewarded by winning in fine style with a significant personal best in 1.51.65, to place him second on the TAC 2014 club rankings. Earlier in the evening there were personal bests for Michael Ellis (2.05.87), Charlie Crick (2.06.42) and Sam Avis (2.13.13), whilst Ben Murphy missed his own by just one hundredth of a second with 2.00.68. Still it was his fastest ever as a 17 year old, since it was also his birthday ! The only other TAC athlete in action was Ashley Gibson who ran 4.23.63 for 1500 metres. Ryan Driscoll was the only TAC distance runner in action, at this meeting. Ryan was representing Sussex in a senior match against seven other counties, including Kent. He won well over 1500 metres in 4.01.12. Dan Watt won the Dartford Half Marathon today in 80.30. On Saturday Henry Pearce (8.34.73) raced the 3000m and Ashley Gibson (4.22.42) 1500m at the British Milers Club Grand Prix Meeting at Stretford, near Manchester. Sean Molloy ran a superb senior boys 800m final to win in 1.50.59. Chris Cohen surpassed all his previous performances to finish second in the Inter Boys 1500 metres, with a new personal best of 3.56.31. As a result Chris has been selected for the England Schools team to compete in the home international. Kathleen Faes (4.43.98) was 7th in the Junior Girls 1500m final, whilst Alasdair Kinloch 9th in the Inter Boys 3000m, with 8.51.40. Then TAC had three athletes in the Senior Boys 1500m final - James West 7th in 3.54.64, George Duggan 9th in 3.58.37 and Corey De'Ath 18th in 4.09.33. Tonbridge AC won this home fixture, which puts us in contention for promotion, with one match left on 2nd August, again at home. 1500m pbs were achieved by Nicole Taylor and Jamie Goodge. At 3000m Nicola Summerfield and Louisa Bryant reduced their best times, whilst Greg Cole set a 3000m steeplechase pb. Jordan Saul also improved his best at 400m. Full results and a summary are on the Results 2014 page. Sean Molloy was in the first event of the championships, in the senior boys 800m and won his heat comfortably in 1.55.32. In his semi final at 5.20pm Sean won in 1.53.07 to qualify for Saturday's final. Kathleen Faes made the Junior Girls 1500 metres final with 4.44.35, qualifying as a fastest loser. Chris Cohen qualified for the Inter Boys 1500 metres final with a time of about 4.04.05, finishing a close up second in his heat. With the three above qualifying plus Corey De'Ath, George Duggan and James West in the senior boys 1500m straight final, we have six TAC distance runners as finalists. Harry Paton finished 9th in 16.02, from 1722 competitors. Full results are at www.cityrace.co.uk . 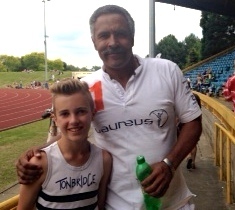 Tonbridge AC finished second in both the division 1 girls and boys competitions. There were outright A string wins for Katie Burgess over 600m and also for Sally Palmer in the division 2, 600m. Full results are on the Results 2014 page. The Tonbridge Parkrun this weekend was the penultimate qualifier for the TAC Grand Prix, organised by Mark Pitcairn-Knowles. Mark has supplied the league table in the file below, with the final run on Saturday 26th July. Nine TAC athletes from the thirteen competing ran personal bests, on warm and still evening. There were twenty 1500 metre races and a couple of 3000s. Miles Weatherseed (3.57.20) and Chris Cohen (3.58.47) both broke 4 minutes for 1500m for the first time, with Miles being the only TAC race winner on the night. A results summary is on the Results 2014 page. 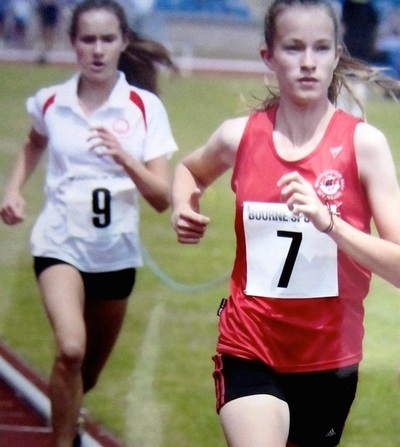 Kathleen Faes (year 8) had a stunning run to win her 1500m championship in 4.35.8. Charlie Crick won the 800m in 2.13 and Ben Errington also won is 800m in a new pb of 2.14.47. Finn Croll, at just 10 years old, ran 1500m in 5.11.7 to finish 5th in his age group and Dan Schofield ran a pb 1500m of 4.53.97 in 6th. Rebekah O'Brien and Lizzie Miller both ran about 2.32 for 800m. More results to follow although they are not always fast at being published. The evening open meeting didn't have as many entries as June, but still produced some good action. Results are available on the Results 2014 page. Videos of the 400m and 1 mile races are also loaded.